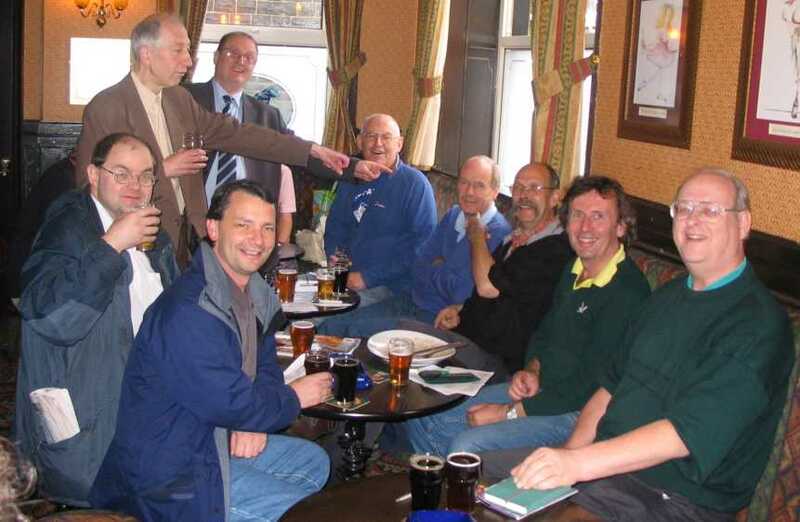 ome seminars did occur at pubs, usually either sociable ones where the landlord knew us and expected this sort of behaviour, or where we were too lashed up to care. Here's a few prime examples including, hearteningly, some recent ones !!! Gen Cheers to Dave Wild for this one ! 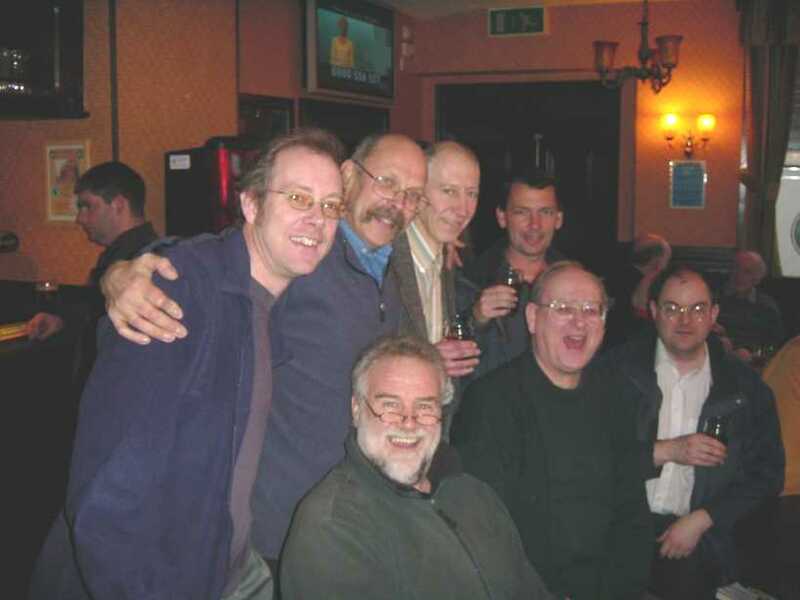 Personnel (clockwise) Dave Knighton, Desperate Dave, Dave Charlesworth, Dave Simister, Dave Bottomley, Dave Wild and Dave Brown. Gen A full complement of Daves!!! 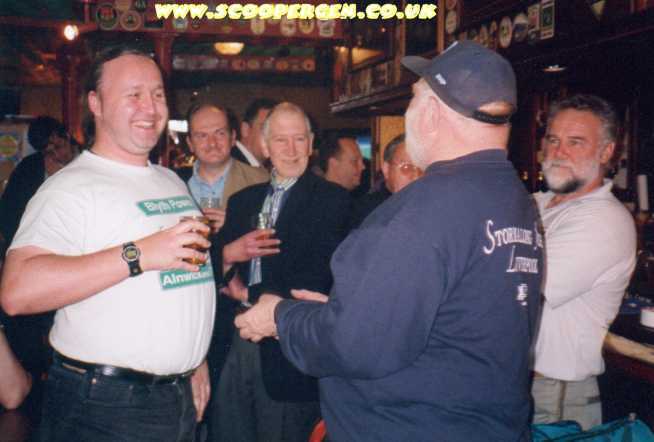 Personnel Simon Fyffe, Gazza, Beavis and Sean "McGowan"
Gen The superb Cask fest always draws the scoopers in! 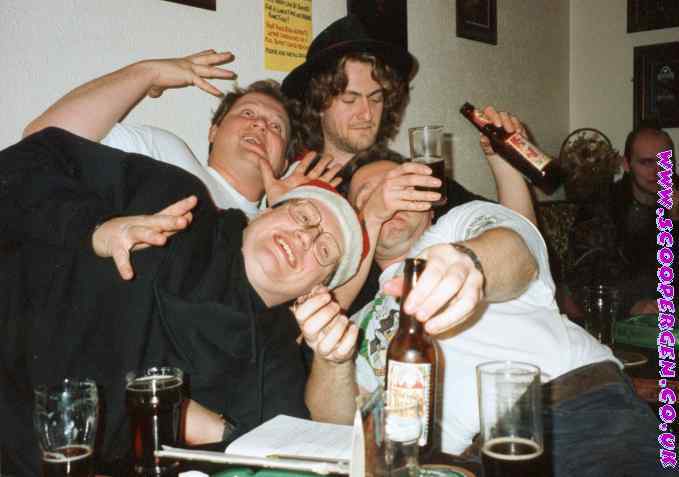 Personnel A big fluffy duck, Tony Sawford, Steve Fulcher, Roly, Dicko and Jonesey. Gen This top pub has now fallen from the scooper's "must visit" list, but for a few years in the 90's it was essential visiting for new beers. Personnel Russ, Nice Hair, Aston, Liam Lomax, Skeletor, Sue, Gazza, Ding Ding, Big Feller and Brian Moore. Gen Another pub to flourish and then fade. the Hebble Brook had connections with the lamented Wild's brewery. Personnel Phil White, Steve Fulcher and Ding Ding and Loaf. Gen Everyone is bellowing at Loaf, who has inexplicably dossed out on the steps! Gen During a tractor tour, this barrel was reckoned to be the hiding place of a certain photter from Dawlish .... Allegedly! 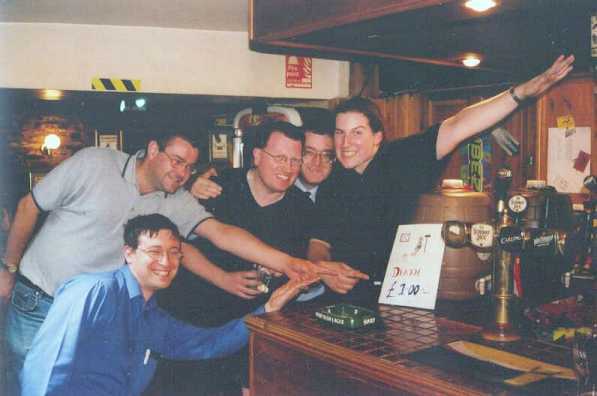 Gen Molly declaring Gazza's 10,000th beer (Boat Rattler) to the pub!